FROM THE COFOUNDER OF SEVENTH GENERATION, the most trusted brand in environmentally friendly household products, comes this indispensable guide to maintaining absolutely everything in the home in a natural, nontoxic way. Jeffrey Hollender leads you through each room of the house with straightforward advice, comprehensive checklists, quick tips, and unparalleled resources while revealing the hidden repercussions of daily routines that most of us take for granted. 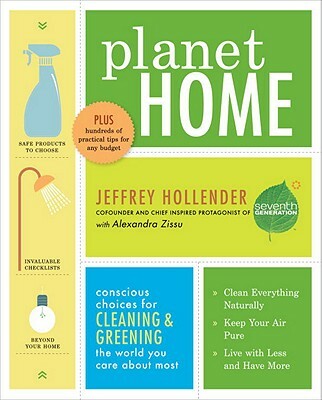 From improving air quality in your bedroom to avoiding mildew in the bathroom, from sourcing local or organic food to safely laundering your clothes, Planet Home offers invaluable information for making conscious decisions for your family, your neighbors, and our shared planet home. With additional information on power, garbage and recycling, air quality, and community activism, this book goes a step further to describe how any household is part of a much larger system. Planet Home offers a unique, comprehensive, educational, and easy approach to helping you and your family lead healthier lives as we collectively protect and maintain our shared resources for many years to come. JEFFREY HOLLENDER is the cofounder and chairman of Seventh Generation, an award-winning company lauded for its progressive business practices. He is also the author of several books, including The Responsibility Revolution, What Matters Most, and Naturally Clean. He and his wife, Sheila, have three children and live in Vermont. ALEXANDRA ZISSU is a writer, editor, speaker, and consultant. She is the author of The Conscious Kitchen and coauthor of The Complete Organic Pregnancy. She lives with her family in New York City.